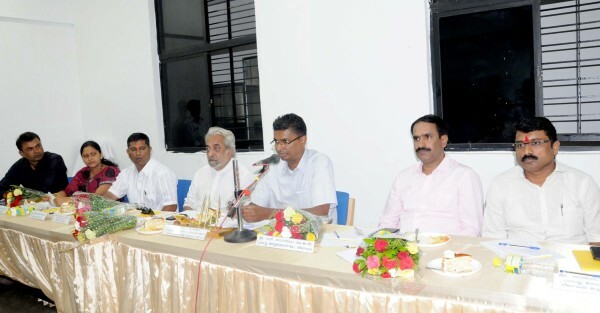 At a review meeting held today to discuss the plan of action on the supply of drinking water to city of Belgaum, District in-charge minister Satish Jarkhiholi said that the people have to be ready to face some hardships for drinking water as the monsoon has been a failure uptill now. The water level of Rakaskop as on July 7 is 2447 feet, last year on the same day it was 2461 feet. The water level in Hidkal reservoir is 2069 feet. About 9-10 MGD water is drawn for Belgaum city from Hidkal. Currently the water is being supplied once in 6 days in all areas and also by tankers in some areas. The current level of water in the reservoir could suffice for about 2 months. Many old wells have been rejuvenated and have been fitted with filter plant through which water is being supplied in those areas. More such wells would be identified and filter plants would be installed on them. Please plan a project of rain water harvesting at least in gardens and making ponds system in last open places in extension areas. By this in going future in 5 to 8 years the ground water level increase and Wells and Bore Wells will survivey in the city.